Burgandy is a fresh face on the tour. At Studio #13, aboard a boat built in Saigon in 1964, she creates woven seed bead jewelry that is unapologetically opulent. This is a rare invitation to visit her compact floating studio in Deer Harbor Marina, where Burgandy weaves detailed pieces inspired by the lamps of Louis Comfort Tiffany, Lalique’s attention to detail, and her grandmother’s costume jewelry. The wood Schooner Sassafrass was purchased in 2006, taken to a bare hull and completely restored by Burgandy and her family. Now a place they call home, this beautiful floating studio is also what Burgandy considers her greatest artistic effort. Sailing her home and studio, Schooner Sassafrass, immerses her in her environment. The water captures the ever-changing light, while the islands’ bedrock, though grounded, effects her movement as the wind passes over them; awarding her with the patience it requires to work with the smallest beads she can find. While weaving is a large component of her art, Burgandy considers herself a glass artist striving to throw light from a sculptural approach to weaving. Living on a boat limits her space, so working with seed glass fulfills her need to maintain a minimalist approach to living, while still allowing her the freedom of creating greatly detailed works. 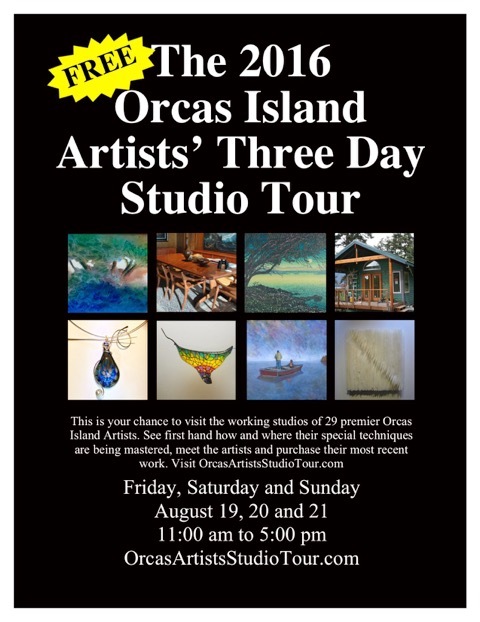 Don’t miss the chance to visit this studio. Find out more about Burgandy Scott’s work at Impish Limpet Designs.